As I've mentioned in previous posts, we're into what I call "Annual Season", the last four-odd months of the year when - once upon a time - the book shops, newsagents and department stores (and Woolies) were deluged with annuals spun-off from any conceivable subject that might appeal to kids. Up until sometime in the late eighties (I can work it out... but I don't have the information to hand at the moment), Marvel UK published their annuals in association with other publishers. IPC/ Fleetway in the early seventies, someone else mid-decade and Grandreams by the late seventies and into the eighties (Grandreams appeared to share not only the same Jadwin House address as the Annex of Ideas but also the same management team somehow). Towards the end of the eighties, M-UK took the annuals in-house and issued them under the Marvel brand. 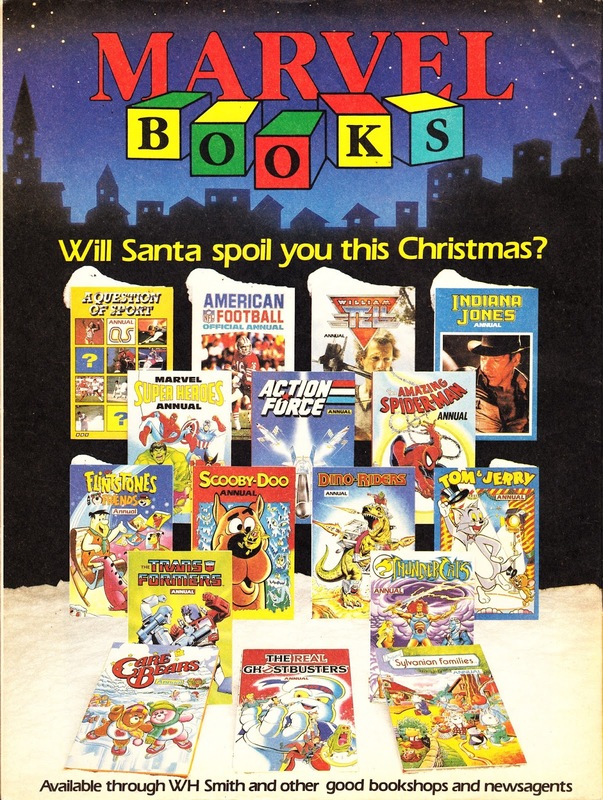 As you can see, they offered a bumper range for Christmas 1989. A QUESTION OF SPORT - A TV tie-in to the perennial BBC quiz show (still going strong today, as far as I know). AMERICAN FOOTBALL - Channel Four were, presumably, still carrying coverage which - at the time - was still a novel taste of Americana. WILLIAM TELL - I've covered this TV tie-in in previous posts. Marvel UK clearly had high hopes for the show (even announcing a fortnightly comic version) but it failed to make any impact. The strips prepared for the aborted fortnightly ran in THE BUMPER COMIC and there was also a graphic novel collected edition and a one-shot special. INDIANA JONES - This Further Adventures of Indiana Jones reprint was - presumably - released to capitalise on Indiana Jones and the Last Crusade. Oddly, there was also a softback version (which I have somewhere). Indy was also appearing in the extremely short-lived THE INCREDIBLE HULK PRESENTS at the same time. MARVEL SUPERHEROES - The modern equivalent of the Marvel annuals that had been doing the rounds - under a number of different titles - since the seventies. ACTION FORCE - The Hasbro toy tie-in. The lead times required by annuals meant it wasn't able to reflect the toy line's relaunch as G.I. JOE: THE ACTION FORCE which officially happened - as far as Marvel was concerned - in December 1989. THE AMAZING SPIDER-MAN - A hardy perennial although I have a hunch that no editions had been published the previous two years, a sad reflection of how far out of favour the character had fallen in the UK. FLINTSTONES AND FRIENDS - This Hanna Barbara tie-in was pegged to a current Marvel UK comic. SCOOBY-DOO - More HB animation antics. DINO RIDERS - This was a Tyco Toys tie-in and - as far as I know - the only thing Marvel (on either side of the Atlantic) did with the property. TOM & JERRY - 'nuff said. THE TRANSFORMERS - By this point in the eighties, well on the way to becoming a Christmas institution. THUNDERCATS - The other big toy tie-in of the era. CARE BEARS - By this point, Marvel had been publishing a regular CB comic for several years as part of the overall merchandising blitz that accompanied the toys. THE REAL GHOSTBUSTERS - Another animation/ toy tie-in. This franchise became something of a cash-cow for M-UK at the turn of the decade, spawning several spin-off comics. SYLVANIAN FAMILIES - I walked past a toy store the other day which had a window display devoted to these critters so they must still be going strong. Marvel also published a regular comic based on the property.